This chart is from a Mother Jones article. Notice that the scores of our kids have been rising for 20 years, yet the gap persists. 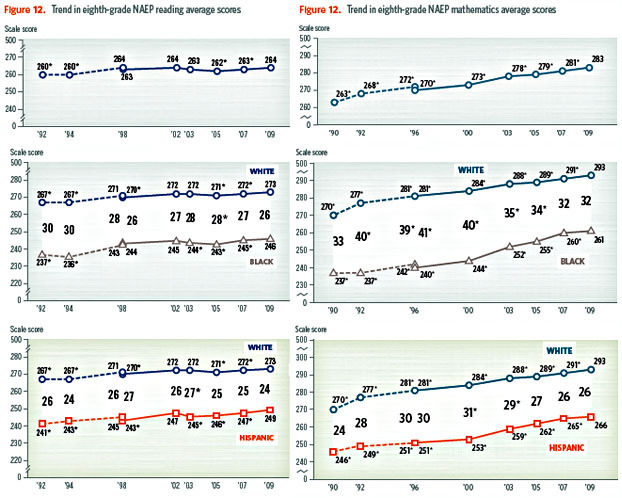 Why does the gap persist even though* scores are rising? Because child poverty in America is too high and rising. If you disaggregate* the data you see that the lowest-scoring* kids come from poverty and our highest-scoring* kids come from affluence. It couldn't be clearer, or more ignored by reformers.